Scene setting: Céline’s Phoebe Philo collaborated with the French artist Philippe Parreno on an experiential runway set. Guests entered the vast space, which featured hundreds of theatre lights hanging on long wires from the ceiling, and were led to stalls of tiered seating. Before the show began, a wall of transparent paper separated the audience from backstage and projected massive shadows of the models interacting backstage, waiting to make their entrance. The installation heightened the sense of anticipation about the show’s start, guests both privy to and yet removed from the activity backstage. 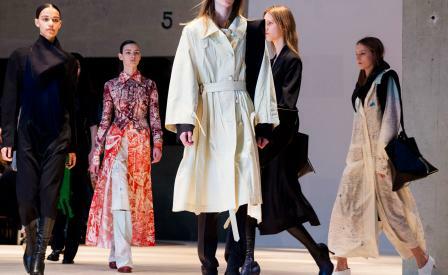 As the first model entered the show space, clad in a papery cream mackintosh, an oversized blazer and a leather headscarf tied around the neck, the seating began to revolve on turntables, turning a full 360-degrees during the show. Mood board: The collection explored the interconnectedness of women’s lives, a preoccupation emphasised throughout the show as models strode at a brisk pace, coming together in groups. They did this in oversized tailoring and map print double-breasted coats (a metaphor for Philo’s focus on feminine possibility? ), fringed or draped dresses, blurry striped shirts and multifarious prints imagined in abstract florals, Pre-Raphaelite bathing scenes and even a family scene of monkeys. Finishing touches: With leather headscarves tied around the neck, and a silk shirt tied around the waist of a tuxedo overcoat, there was a real focus on pragmatism within the collection, and an urgent sense of busy women on the go. This idea was further explored in the huge oversized and practical bags with thick, sturdy straps and second-skin like leather boots. Philo may have been creative director of the French house for nearly a decade, but she lives and works in London. This sense of British identity was reflected in folded mohair blankets, which models carried tucked under the arm, bearing the names of traditional dishes like ‘bangers and mash’, ‘beef stew’ and ‘sticky toffee pudding’.